As of 8 p.m. ET the NHC reports that Hurricane Gustav has maximum sustained winds of 80 mph and a minimum central pressure of 975 mb. This makes Gustav a Category One storm. 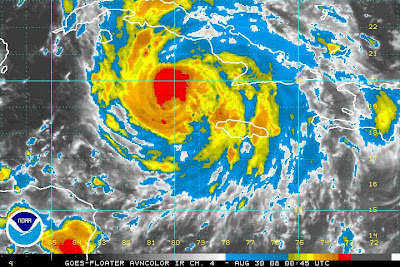 Gustav is projected to cross over the Cayman Islands tonight and the western tip of Cuba later tomorrow. The NHC cone of uncertainty shows Gustav making landfall on the US Gulf Coast somewhere between Corpus Christi, Texas and Gulf Shores, Alabama late Monday or Tuesday as a major hurricane. INTO THE NORTHERN GULF COAST FARTHER EAST. This is significant because these three models usually seem to be more accurate with tropical systems than the models that are showing it further off to the west. Having said that, the 18Z models seem to all be trending to the west, thus decreasing the threat to Alabama and Mississippi. Obviously all interests in the Gulf states should all stay tuned for the latest on this developing situation.